Attached to the Professed house is the world famous Basilica of Bom Jesus where the Relics of St. Francis Xavier are enshrined. 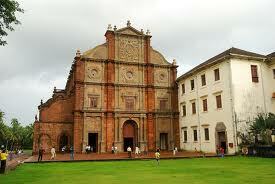 The foundations were laid in 1594 and it was consecrated by D. Fr. Aleixo de Menezes in 1605. The Church was raised to the rank of a Minor Basilica by Pope Pius XII in 1946. The Church and the residential house were erected by the architects Bro. Domingos Fernandes and Julio Simao. under the care of the Archbishop. Later a Seminary was established there, but when it was abolished, the house was entrusted to a Canon who thus became its Administrator. At present it is administeredgy an administrative Committee appointed by the Archbishop. This vaultless, one - naved Church has a beautiful façade looking towards the west, with three elegant porticos. These porticos are topped by three large windows and above them we see three circular windows. The topmost part forms a quadrangle richly embellished with arabesques with the Jesuits' emblem in the centre. This elaborate piece of workmanship is a combination of five architectural styles, viz. the Jonic, the Tuscan, the Corinthian, the Doric and the Composite. Just inside the entrance, we see two pillars supporting the choir loft, with two inscriptions, one in Portuguese and the other in Latin: ESTA IGREJA DE JE / SVS SE COMECOV A 24 DE NOVEMBRO DE 1594 E / CONSAGROV-A O REVE / RENDIS. E ILLUSTRIS. SENHOR D. FR. ALEIXO / DE MENEZES ARCE / BISPO DE GOA PRI / MAS DA INDIA ANNO / DO SENHOR 1605 / 15 DE MAIO (This Church of Jesus was begun on 24th November 1594. It was consecrated by the Most Rev. D. Fr. Aleixo de Menezes, Archbishop of Goa and Primate of the Indies in the year of the Lord 1605, on 15th May). HANG ECCLESIAM / JESV SOLEMNI RITU/ CONSECRAVIT REVE/RENDISSIMUS ET IL / LUSTRISSIMVS D. ALEXIVS ARCHIE / PISCOPVS GOENSIS INDIAE PRIMAS / ANNO DOMINI / MDCXV. MA. On the wall near the pulpit, there is the cenotaph of Dom Jeronimo Mascarenhas, the founder of this Church. Its apex is made of bronze, richly gilt and supported by two figures of lions. The exploits of this Captain are represented on four plates in deep relief, with the following inscription: SEPVLTVRA DE DOM HIERONI / MO MASCARENHAS, CAPITAM Q FOI DE COCHIM E ORMVZ, A CV / IA CVSTA SE FEZ ESTA IGREJA; /EMGRATIFICACAM A COMPANHIA/DE IESV LHE DEDICOV ESTE LVGAR. FALECEO NO ANNO DE 1593. (The tomb of Don Hieronimo Mascarenhas, ex-Captain of Cochin and Ormuz, at whose cost this Church was built. In gratitude the Company of Jesus dedicated this place to him. He died in the year 1593). The majestic pulpit on the right, embodies four sculptures of Evangelists and four of Doctors in bold relief. It stands on the bare back of seven strong figures, seven being a sacred number in the Holy Scriptures. The main altar has a gilt altarpiece with a 2.86 meter high statue of St. Ignatius of Loyola, founder of the Society of Jesus. Dressed in Mass vestments, he has his right arm raised and his eyes turned towards heaven; the sculptor represented the attitude of Ignatius at the time when he exclaimed in ecstasy: Quam sordet mihi tellus quum coelum aspicio! (How doth the earth fill me with disgust when I lift my eyes to heaven). Below it, there is an image of Bom Jesus. On the top, there is a sculpture of the Holy Trinity and below it, the emblem of the Society of Jesus. Portugal's patron saint and that of its colonies. The other is dedicated to St. Francis Xavier. In 1622 the image of St. Francis of Borgia was transferred to the side altar and the Relics of St. Francis Xavier were kept in its place. But in 1655 they were taken definitively to the Chapel where we see them today; and the tabernacle which was here, was transferred to the Chapel of St. Francis of Borgia. Since 1779 the cerimonia de posse(empowering ceremony) of Vice-Roys and Governors took place in this Church. The Bishop solemnly handed over the staff, to the Governor who returned it only after the end of his term. The walls on the way to the sacristy are decorated with nine beautiful canvasses. The richly carved teak door of the sacristy has the sculptures of four saints in deep relief namely, Peter, Paul, Ignatius and Xavier. This door has been elegantly decorated with foliage designs. The sacristy has a vaulted roof with fine stucco work. This sacristy which is the largest and the richest in Goa has in its corners four colossal chests of drawers; on the lateral sides there are still another four. They are made of black wood with foliage and floral designs. They have gilt labels indicating the contents. At the further end of the sacristy, there is a Chapel of Our Lady of Sorrows decorated with azulejos brought from the sacristy of St. Francis of Assisi's Church and from St. Augustine's. This sacristy was built at the expense of Baltazar da Veiga from Lisbon.